Sometimes you may want to just disable and turn off the cellular cell phone function only on iPhone, but continuing to connect to Internet via WiFi wireless connection and accessories via Bluetooth. Doing so allows one to stop making and receiving any phone calls, sending or receiving SMS text messages (and also connect to mobile data regardless of whether it’s 2G, 3G or 4G), but can continue to connect to Internet using Wi-Fi to use the apps such as Whatsapp, Safari (web browser), Viber, Tango, App Store, Uber, Google Maps, Google Calendar, Mail, Messenger, Facebook, Twitter, Hangouts, Skype, Telegram, Amazon, Dropbox, OneDrive, Camera with full GPS geotagging, and basically any other apps. In addition, disabling especially the phone calls functionality can minimize the disruption when shooting video in long duration using the iPhone, as incoming call will stop the video recording. 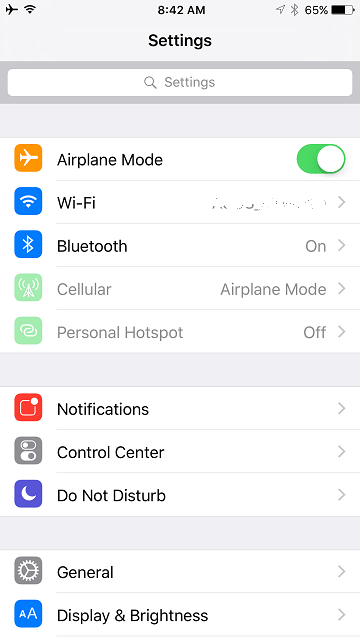 iOS itself does not provide an direct way to disable the cellular connectivity completely, even though there is option to turn off Cellular Data (mobile data which affects only Internet connection but not phone calls nor SMS text messages). But with the following trick you can easily turn off cellular functions completely, while allowing Wi-Fi and/or Bluetooth to remain enabled. 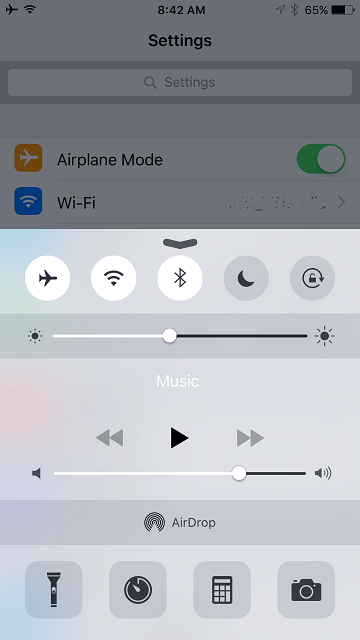 Go to Settings app, or slide up from the bottom to bring up the Control Center. Now, turn on the Wi-Fi and/or Bluetooth functions (in Settings app, tap into Wi-Fi and/or Bluetooth to enable them). The iPhone is now working like an iPod touch / iPad, without phone functions. When you want to re-enable the cellular phone functions again, just turn off and disable “Airplane Mode”. The trick works on every iPhone models and iOS versions, including iPhone 4, iPhone 5, iPhone 5S, iPhone 6 (Plus), iPhone 6S (Plus) and future newer iPhones.